Wondering where I have been? Busy helping my daughter plan her fall wedding! I was so excited when she asked me to take the lead on decorations, but I had no idea what I was getting myself into. No worries. I am always up for a challenge, and the accompanying opportunity to learn. The following list is for a tall vase bouquet. 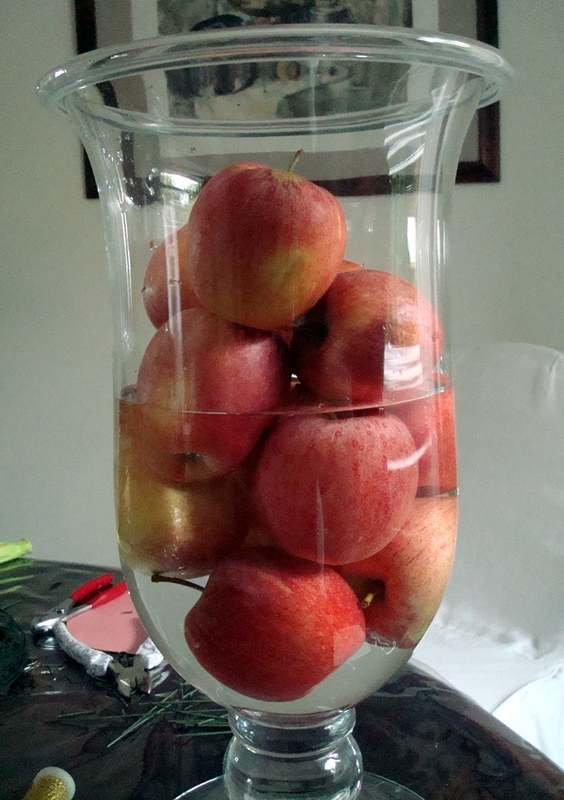 However, if you prefer, you could use a short, five to six inch vase. Just use one third less flowers. 6 feet of small gold wire. Before beginning the arrangement, be sure to clean all of your flowers. Their stalks should have no leaves and should be cut at a diagonal. Now it's time to go to work! Add cold water until the fruit is completely covered. Make sure you will have enough so that the flower stalks will be able to drink! Here's where it really gets fun! Start adding the oak leaves. They should be about 16 inches in length, including stem and leaves. Next add the three lilies, cut at approx. 12 inches in length, making a triangle placement. Add the red/orange daisies (cut at 11 inches), the heather, and the green daisies (also cut at 11 inches). Keep in mind that this is a tall vase and most of the flowers should be around the edge where they will be seen. Now add the roses, alstroemeria, and dill (all cut at about 12 inches). Next we will use the chinese lanterns to make two garlands. Cut your length of wire in two so each measures approx. three feet in length. Remove the lanterns from the first stalk, and wrap each lantern stem along the first wire. (The process is: one wrap of the wire around a stem, followed by a twist.) Try to make the distance between each lantern random. Repeat for the second stalk and wire. Once your two garlands are complete, hand them over the bouquet. They look like earrings! If you would like, you might also add a bit of raffia to cover any part of the vase that still shows chicken wire. You could also add bits of orange sisal threads around the bouquet to give a halo effect. 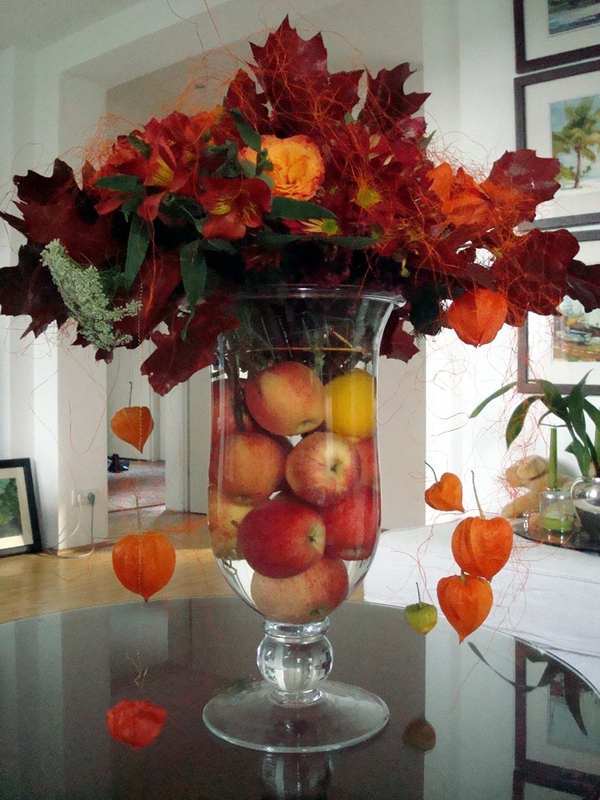 Now imagine a small wedding reception hall full of these tall and short fall flower arrangements! It will be striking! Interested in seeing all of my tutorials? Please click here. Very nice and helpful! Thank you! Valerie, those centerpieces will be BEAUTIFUL! What gorgeous colors! Thanks for your encouragement, Everyone. I am really looking forward to seeing these at my daughter's wedding! Perfect. The color combination are terrific. Yes! The wedding reception hall looked amazing filled with these arrangements. Many thanks for your comment.